In conclusion, the market has now rallied right up to resistance, so we could see some backing and filling to start the session today. 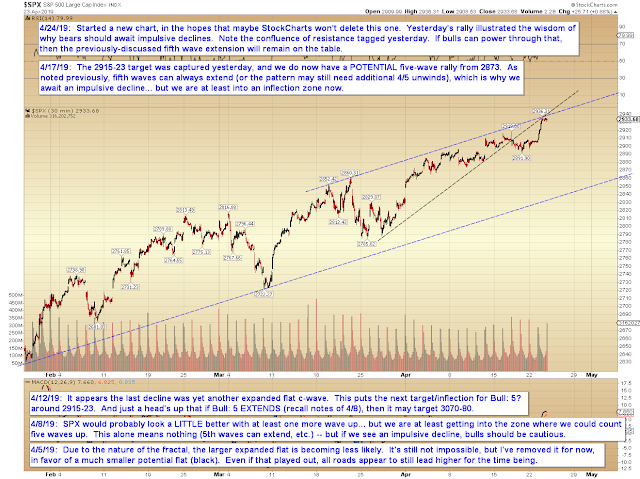 Normally, given the momentum of yesterday's rally, we would expect to see higher prices once that completes. 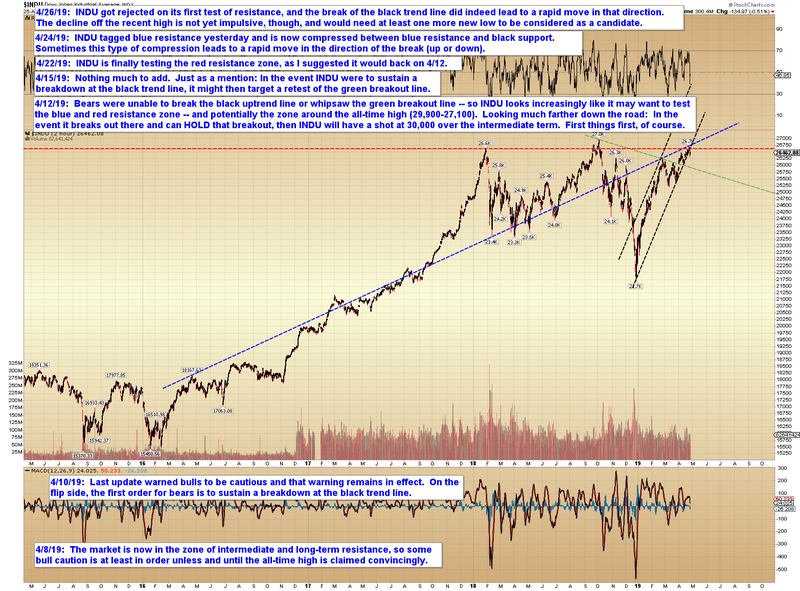 And both of those things happened on Wednesday, as SPX meandered around before making a very slight new high. Thursday saw an early sell-off to get bears excited, but SPX recovered before the close. There's still nothing concrete in the charts that screams "short!" 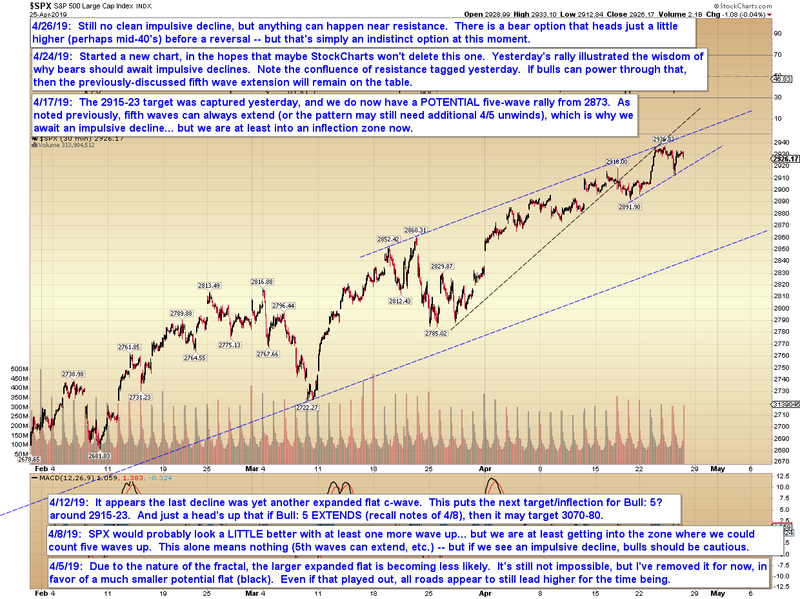 but we are still testing intermediate resistance, so anything can happen at a time like this. 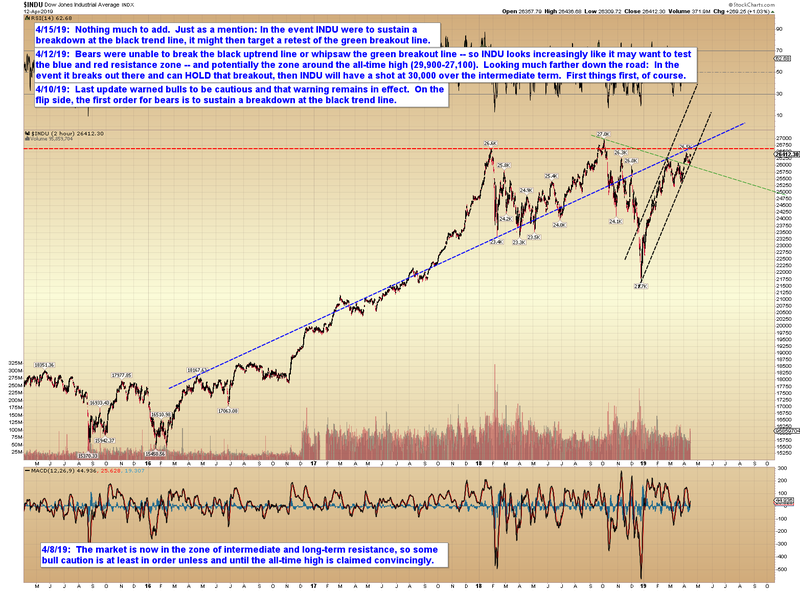 SPX has created a bear option for itself -- but this is simply an option at this point. In conclusion, bears would need to kick out yesterday's low (first potential support is near 2920 and rising) to start to open up more options. Otherwise, the main thing they have going for them is the test of resistance, which can always lead to a rejection. 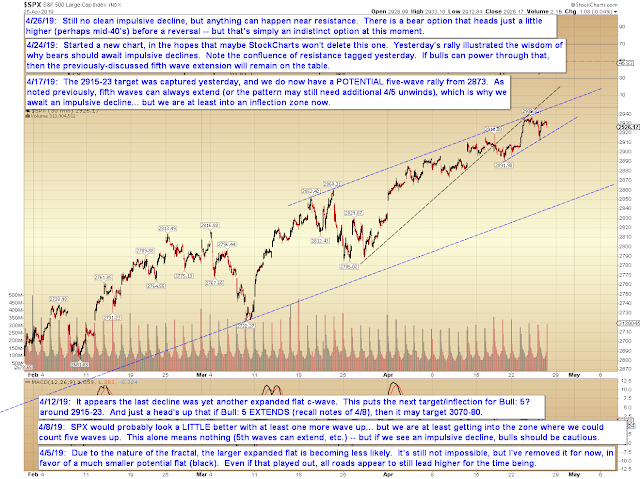 For that reason, bulls should be cautious here, but there's nothing definitively bearish about the charts yet. Trade safe. Yesterday (and the entire last few months, really) illustrated the wisdom of why bears who are looking to buck the prevailing trend are wise to await an impulsive decline before doing so (for more on this, see: Why Impulsive Turns Are Important). In conclusion, the market has now rallied right up to resistance, so we could see some backing and filling to start the session today. 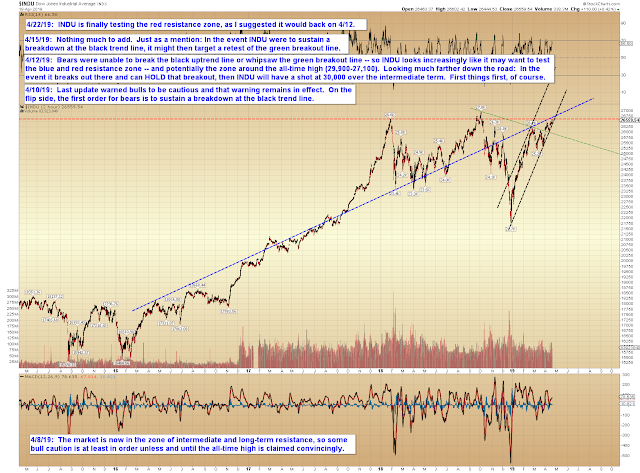 Normally, given the momentum of yesterday's rally, we would expect to see higher prices once that completes. 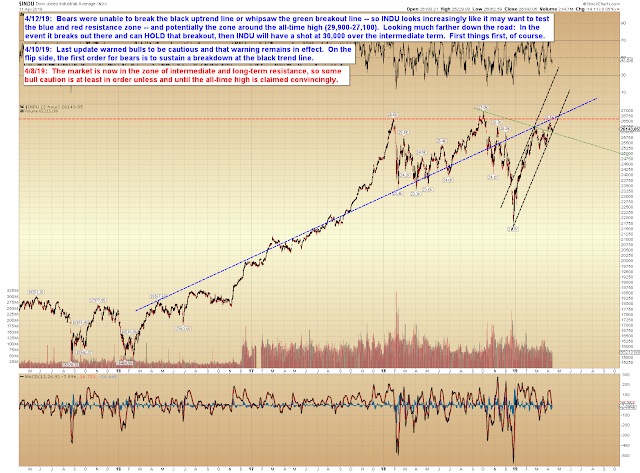 Of course, in the event we see an impulsive decline in the interim, then that could always change. Trade safe. So another exciting week in the market has come and gone. Last week the market did what it does best lately: Nothing. I'm not going to update the SPX chart, because every time I try to, StockCharts deletes ALL my annotations -- so I'll simply note that while SPX has reacted to the noted inflection zone, we don't know yet whether that will be short-lived. 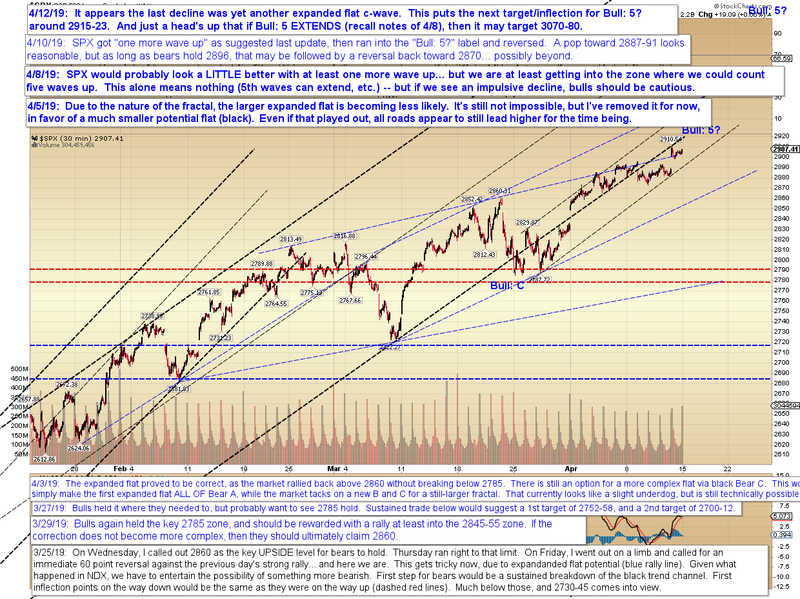 Bears will need to sustain a breakdown at 2875ish to at least begin to open up possibilities on their end. 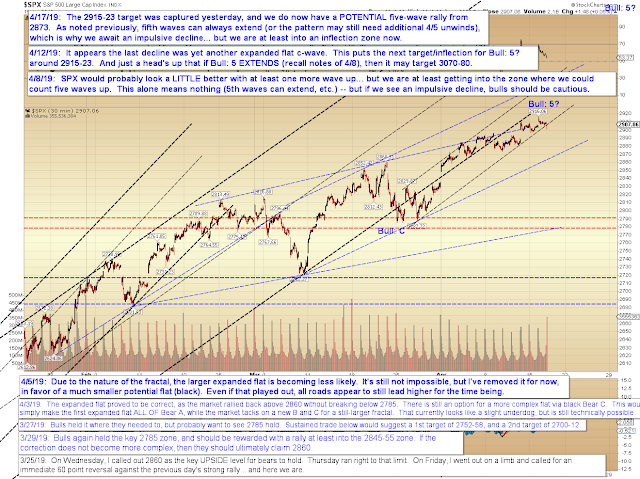 In conclusion, last week began and ended in roughly the same place, providing little in the way of new information. 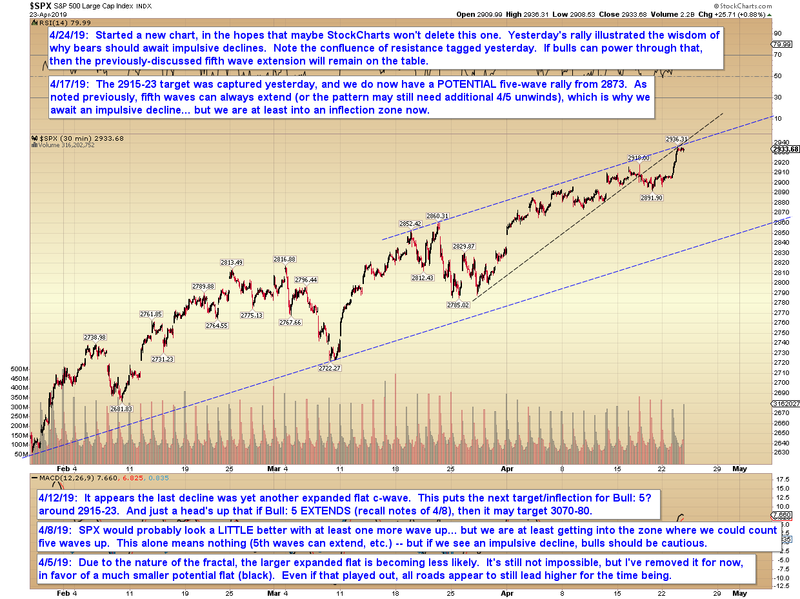 As I suggested on April 12, this would take a little time to play out once we hit resistance, which we've now done. As soon as new information becomes available from the market, we'll have more to talk about. Trade safe. 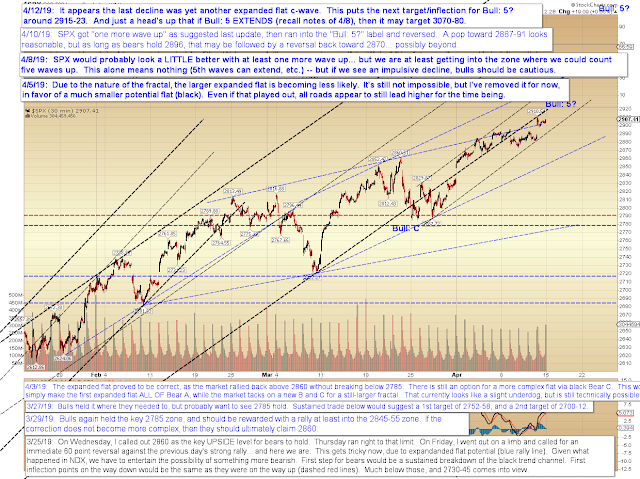 Friday saw the market gap up, as is its wont of late, then grind around and go nowhere else for the day -- as is also its wont of late. Accordingly, there's nothing at all to add to Friday's update. If you'd like to reread it, it can be found here: Friday's Update. In conclusion, there's just nothing to add since Friday -- as I noted in that update, the larger inflection point will take a few sessions to play out. Trade safe. Are You Trading or Gambling? And... Are You Sure? In this piece, we're going to talk a little bit about trading psychology, and one of the many ways in which we can derail ourselves as traders. Recently I was asked by someone, "Isn't trading inherently just like gambling?" I began to respond with a well-rehearsed "No, of course it's not," along with my oft-given ready explanation of the difference between blind chance and trading -- but then I thought a little more deeply about it, and decided I may have some insight here that's worth sharing. 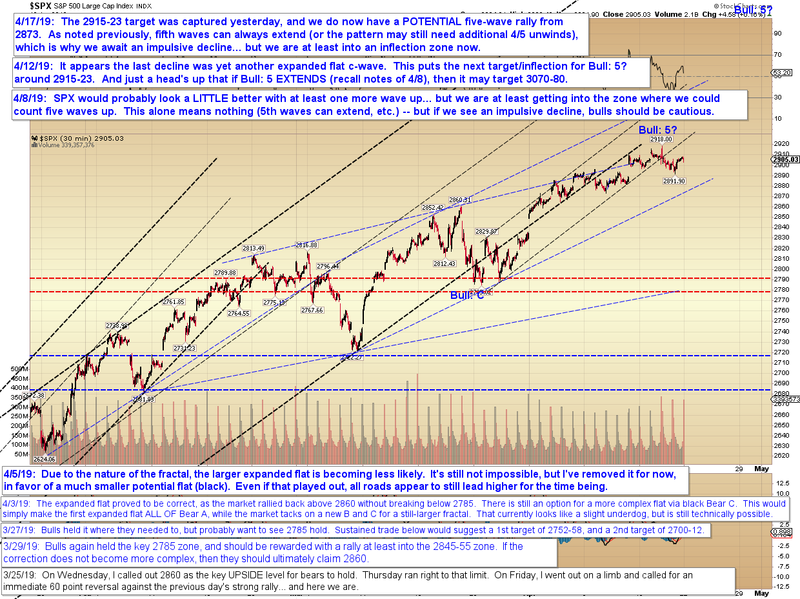 One CAN approach trading as one would approach any game of chance — for example, one can enter a trade on “hope” or on a “hot tip” or on a “lucky feeling” or because Jim Cramer screamed to buy XYZ last night… and then pray their trade makes money. And for those types of trades, yes, trading is gambling. One-hundred percent. Or you can approach trading not as blind chance, but as a calculated risk. This is the same way one approaches starting a business, buying a house, marrying a spouse, or crossing a busy street -- and while some would argue those things can fall under a loose definition of the term "gambling," most people instinctively understand the difference between pure gambling and calculated risks. Calculated risks are still a "gamble" in the loose definition of the term, but they are not at all "blind chance." 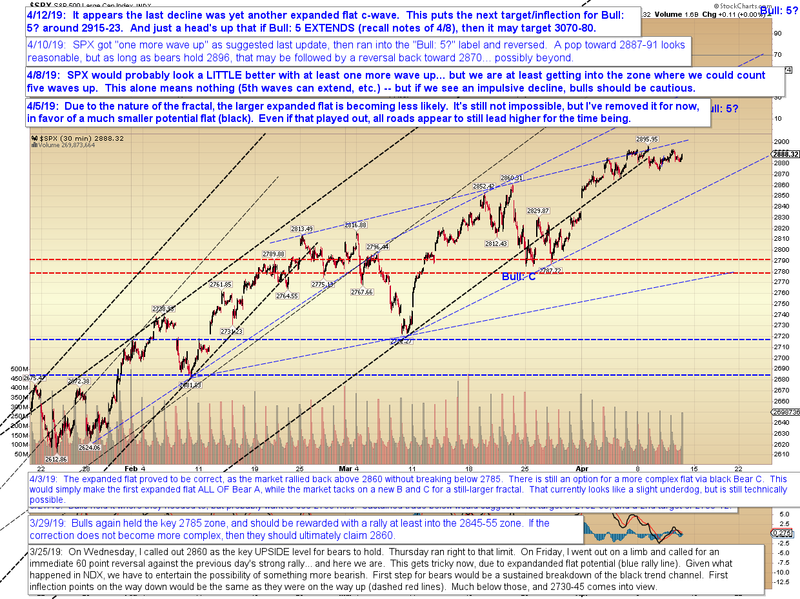 So what turns a trade from a gamble into a calculated risk (or vice versa)? The first step most traders take, prior to taking on risk, is to analyze the trade using whatever system(s) work(s) for them. Some people analyze stocks using fundamentals, such as the underlying strength of the company, the company’s potential future earnings, the overall economy, whether the company is expected to gain or lose market share, whether the company has a hot new product coming out, etc. Others (myself included, obviously) use technical analysis, wherein you recognize that people behaving as a herd are somewhat predictable, and that the herd leaves repeating (and thus predictable) patterns on the price charts through their behavior. It really doesn’t matter what system you use: What matters is that you’re familiar with it and you have a decent grasp of that system’s expected win:loss ratio. That matters because one of the most important equations that separates “gambling" from “calculated risk” is the risk:reward ratio (I’ll explain why in a second). But the point is, you need to have a decent idea of your expected win:loss ratio in order to accurately assess whether your trade's risk:reward ratio is beneficial over the long haul. For those who don’t already know, basically the risk:reward ratio is exactly what it sound like: It's how much potential risk your trade carries if it loses vs. how much potential reward you stand to gain if your trade succeeds. To use a simple example, let’s say you buy a stock at $100/share expecting it will go to $200/share. Due to your analysis, you likewise know that if it drops below $80/share, then that’s a big red flag that would suggest you read the whole thing wrong and the stock is NOT going to $200/share. You might set your stop loss at $80/share in that case. So your risk is 20% (buy at $100; sell at $80 if wrong), while your potential reward is 100% (buy at $100; sell at $200 if right). That means you stand to make five times as much if you’re right as you stand to lose if you’re wrong. Your risk:reward is thus 1:5, which is good. And that example likewise begins to illustrate why the risk:reward (R/R) ratio is arguably the most important metric in trading, and one that’s too often overlooked. Think of it this way: Using our above example of a 1:5 R/R, even if you’re wrong a full 80% of the time, you will make money over the long haul (presuming you invest equal capital each time). Using just one share of our $100 stock to illustrate (and ignoring commissions for purposes of illustration): If you’re wrong 80% of the time, then 8 times out of 10, you lose 20% (which would equal $160 total loss) — but two times out of 10, you make 100% ($200 total profit). Your profit on 10 trades is thus $40; so that strategy, while having high variance (meaning it has big ups and downs, and thus requires a large amount of capital in order to ride-out the losing streaks), is still a long-term winner. Managing your risk, knowing where to exit and following through on that, so that you didn’t lose more than 20% each time you were wrong. 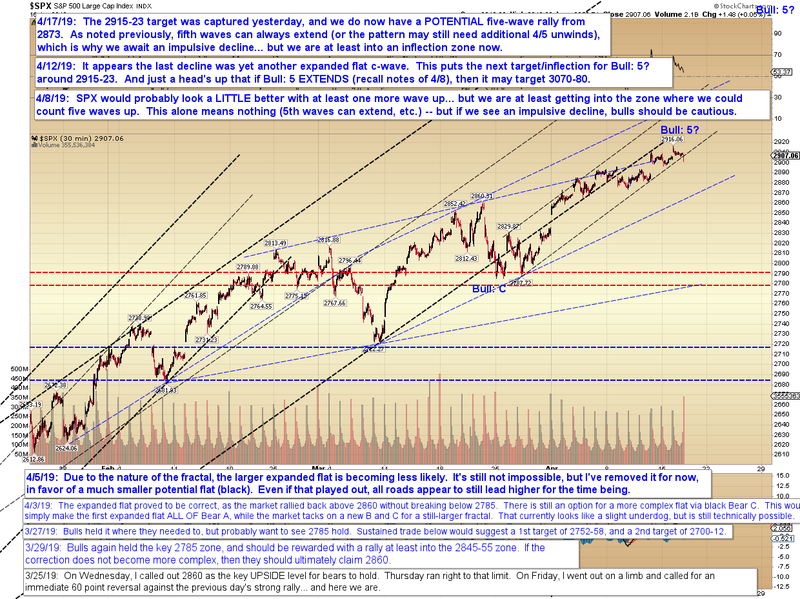 Correctly assessing your potential reward, and staying in the trade long enough to realize that reward. One of the reasons most people fail at trading is because it requires a BRUTAL level of self-honesty. To whatever degree you rationalize your trading decisions and avoid cold, hard rationality, you edge closer to being a gambler. Because in order to correctly assess your risk:reward odds, you must be both willing and able to ignore that which you “wish to be true” and focus 100% of your attention on that which is ACTUALLY true. For example, if you're a bear in a bull market, you can't just run out shorting every rally because you "want" it to end soon, and you can't afford to engage in confirmation bias by only looking at the market's negatives. Vice-versa if you're a bull in a bear market. But the reason self-honesty is so important is that if you can’t (or won’t) see and accept what’s really going on in the market, then you will consistently underestimate your potential risk, while at the same time overestimating your potential reward. 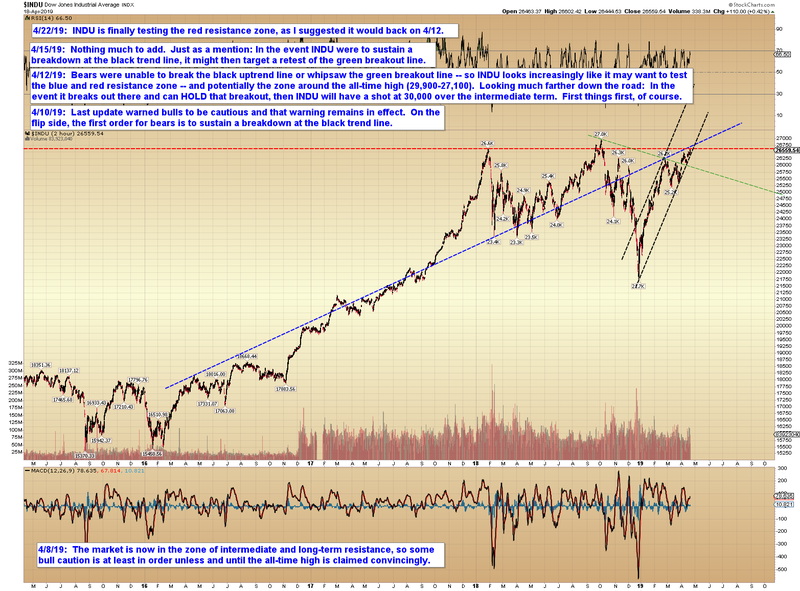 Bears will think "the big decline" has better odds than it actually does. 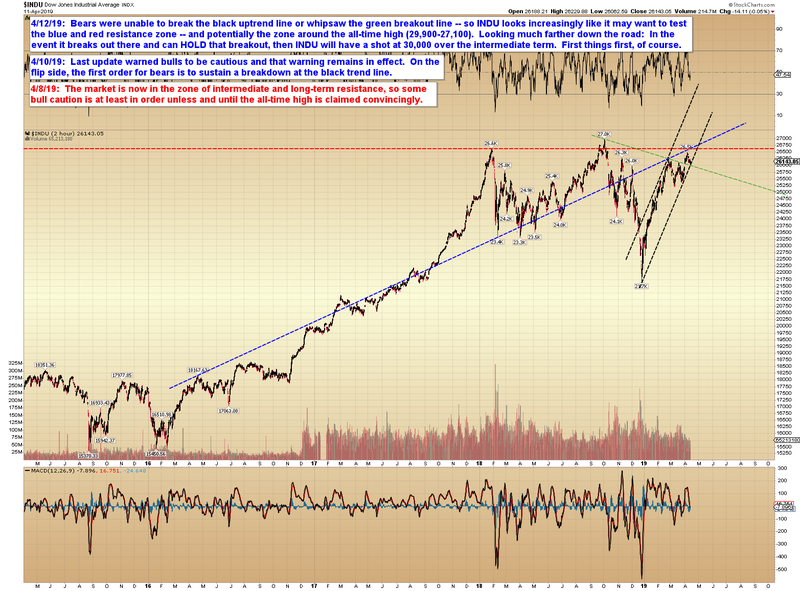 Bulls will think "the big rally" has better odds than it actually does. 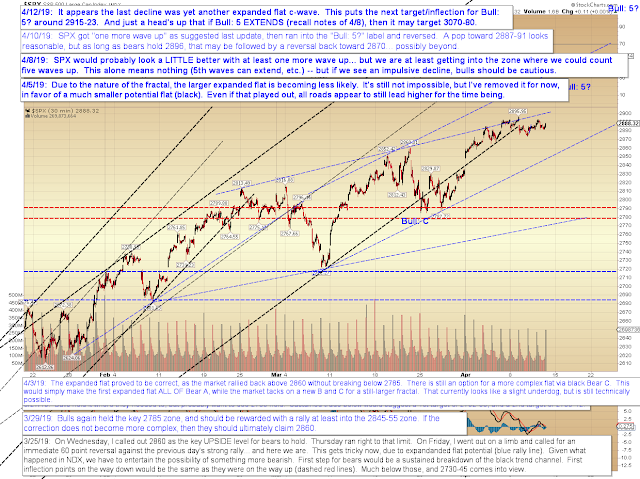 Both will see rallies and declines coming when the market plans to do the opposite. The risk:reward assessments they create will consistently be WAY off, due to being based in bias and not in reality. Ignoring reality in favor of bias is a sure-fire way to kill an account, and quickly. Because in that case, you may "believe" you are taking trades with a 1:5 risk:reward ratio (or similar), when in reality you are taking trades with a far less profitable ratio -- perhaps even a 1:1 ratio. Or worse. Couple that with the human tendency to hold losers too long and to let go of winners too soon (see: Prospect Theory), and you have a recipe for absolute disaster. Consider that if you’re already looking at your trades with rose-colored glasses (rationalizations and not reason) AND you’re not going to maximize each win -- but you WILL maximize each loss -- then you will actually overestimate your potential reward TWICE in the equation and underestimate your potential risk TWICE. And you will do that on each and every trade! It's not hard to see how this "perfect storm" of psychology gone wrong would inexorably lead to a rapidly-shrinking trading account. The only solution I know to the first problem (of "seeing what we want to see" instead of seeing what's really there) is to assign truth the highest value in our internal hierarchy. We have to value truth over even our own feelings of self-worth (because that's what it all goes back to, really: It's a battle between what's actually true and the ego's need to be "right," which we sometimes can't help but tie to our feelings of self-worth, to a greater or lesser degree). I don't know if it's possible to entirely eliminate the ego tie to being right or wrong -- because let's face it: It's hard to feel too good about ourselves if we're consistently wrong about things, but we do feel good when we're consistently right. The key is not to bullsh*t ourselves and try to convince ourselves we're right when we aren't, simply to avoid "feeling bad." The beauty is, this isn't as much of a dichotomy as it may seem at first glance, because the more clearly we see reality as it truly is, the less often we will end up being wrong in the first place! And if we are exceptionally good at managing our internal worlds, then while we may not be able to eliminate ALL the feelings that go along with being right or wrong, we can at least prioritize our willingness to see the truth and to course-correct when we are wrong above the "need to be right." If we've organized that hierarchy correctly, then being wrong will cause us less internal pain than being obstinate in the face of countermanding evidence. And once that happens, we will begin to naturally prioritize seeking truth first and the need to "believe we're right" second. As to the second problem (of holding losers too long and letting winners go too early)... well, the only solution I know of there is discipline. We have to recognize that our natural tendencies in that regard will lead us astray in trading, so we simply have no choice but to override them -- by brute emotional force if necessary. If we are entering trades where we know our potential target levels and our potential stop loss levels ahead of time, then it gives us clear "non-emotional" levels to use to override our natural urges. So those are some of the ways we can determine whether we're trading or gambling. Many of us (wittingly or otherwise) perform a mixture of both. But the key takeaway here is that the more we can correctly align with reality and ignore our own rationalizations, the more capable we are of making an accurate assessment of our risk -- which is exactly what's needed to make each trade a true calculated risk. The less we align with reality, the less accurately we can assess our risk, which weakens or removes the "calculated" portion of the equation. And if we remove "calculated," then all we're left with is "risk." And at that point, we are simply gambling.